It’s hard to believe we’ve already made it to the last tournament of the regular season of the ATP World Tour! The tour wraps up this week in Paris, with 2 more spots on the line for a spot in the World Tour Finals happening later this month in London. Marin Cilic moved up to the 9th position after winning the title in Basel Last week, with Dominic Thiem just ahead at #8. The year end #1 ranking is also on the line in Paris as Andy Murray closed in on current #1 Novak Djokovic by winning the title in Vienna last week. American Jack Sock won his 2nd doubles title of the year, this time with partner Marcel Granollers. This was Jack’s 4th final (singles and doubles) since the end of the US Open. Jack Sock for President! 2017 marks the 10 year anniversary of the BNP Paribas Showdown. The annual event, held at Madison Square Garden, features the top names in tennis facing off in an exhibition match in celebration of World Tennis Day. This year’s event features Venus Williams vs Garbine Mugaruza, Jack Sock vs Nick Kyrgios, and Kei Nishikori vs Juan Martin del Potro. The showdown is March 6th 2017 at MSG and tickets are on sale now! We might have took the long way, but we finally got to see Shania Twain in concert for the first time last night! There may or not have been some fangirl tears shed at the show. Shania’s “Rock This Country” Tour hit Madison Square Garden, for what is likely her last NYC show … ever. (Shania announced in advance that this would be her final tour.) She proved time and again that after all this time, she’s still the one. If you’ve seen videos from Shania’s “Still The One: Live From Vegas” show, you might be expecting her to pull out all the stops for her final tour. After all, that show had everything: elaborate sets, horses, backup dancers, many costume changes, etc. But the “Rock This Country” Tour set is surprisingly simple. The stage had the large video screens, pyro and moving parts we’ve come to expect from arena tours, but the real focus was on the music. Shania’s voice and stage presence alone are enough to get the whole crowd rocking. Her voice is as strong as ever, and yes, she can still hit that note in “From This Moment On.” Her large band also helped put the “rock” in the “Rock This Country” Tour! The show was a full blown rock show, and Shania’s band proved that you can rock out on a fiddle! 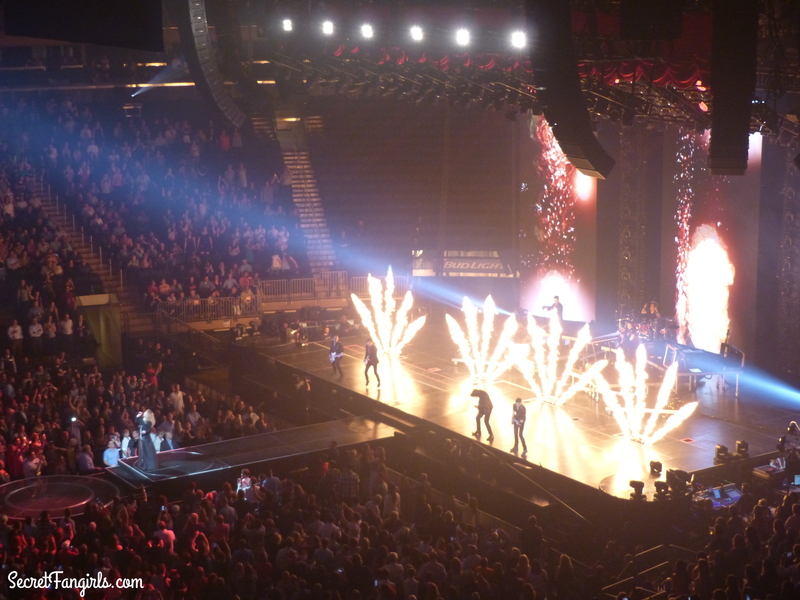 During Shania’s costume changes, her band played impressive arrangements of her biggest hits, keeping the energy high. Shania has so many hits that her nearly 2-hour set went by in a flash. We could have stayed for another 2 hours, and she certainly would have had enough music to fill it! The arena-wide singalong that happened during “You’re Still The One” was one of the loudest and most emphatic we’ve ever heard. Everyone in the Garden was screaming every word. Chills. The “Rock This Country” Tour runs through the end of October, and like we said, it’s Shania’s final tour, ever. So don’t be stupid and get your tickets now! Get ready to shake your bon bons, because Ricky Martin is going on tour! The One World Tour kicks off in September in Las Vegas, and is Ricky’s first major North American Tour since 2011. The tour is in support of his latest album, “A Quien Quiera Escuchar,” out today. Tickets go on sale on February 20th. Check out the dates below and start livin’ la vida loca. Watch the video for Ricky’s latest single “Adios” and pickup a copy of his new album on iTunes now! Be sure to follow Ricky Martin & Secret Fangirls for more updates! Dan + Shay Summer Tour Dates! It’s no secret that we are huge fans of Dan + Shay, and have been impatiently waiting to finally see them on Hunter Hayes’ “We Are Not Invisible Tour” in May! We’ve had their debut album, “Where It All Began,” on repeat since it was released, and they have the perfect sound for an outdoor summer concert. Their single, “19 You + Me” just went gold this week! They’ll be on tour with Hunter Hayes and Blake Shelton this summer, and have a few festival dates as well. Check out all of Dan + Shay’s upcoming tour dates below! Now what do we have to do to get them to have a headlining show in NYC? You can also meet Dan + Shay at most shows, either by getting a “Dan + Shay + You” VIP experience, or at a signing post show. Be sure to follow Dan + Shay on Twitter for the location! Fangirl Tip: If you bring or buy a copy of their album, you can go to the front of the line. Be sure to follow Dan + Shay and Secret Fangirls on Twitter for more updates! 6/22 – Little Rock, Ark. 8/1 – New York, N.Y.
8/2 – Darien Center, N.Y.
9/6 – San Diego, Calif.
9/13 – Mtn. View, Calif.
10/3 – Las Vegas, Nev.